Q: WHAT IS YOUR FIRM’S CONTINGENCY FEE? A: Our contingency fee varies anywhere from 20%-33%. The fee is based on the severity of the injury/accident, the nature of the case, the complexity of the case/accident, the impact the injury has had on the claimant, along with the credibility/likeability of the injured accident victim. All of these factors are taken in to consideration when assessing our contingency fee. Q: DO YOU CHARGE ME EVERY TIME YOU SPEAK OR COMMUNICATE WITH ME? A: NO! It’s totally FREE to speak with or communicate with Brian Goldfinger, any of my lawyers or any of the staff at my law firm. Unlike other law firms who charge you every time you pick up the phone and speak with them, that’s simply not how our law firm operates. A: This is a tricky question to answer, but one that’s almost always asked by our clients. Assessing the value of a case upfront is much like gazing in to a crystal ball and predicting the future. It’s very difficult to say at an early stage. The value of one’s case depends on a lot of factors including but not limited to: liability, causation, damages, age of the injured party, their pre-accident health/earnings, how the injuries have or have not healed in the future, availability of collateral benefits, past/future care costs, likeability/credibility of the parties involved in the litigation, support from the family doctor or other doctors. There are ranges for general damages which vary, but there are also individualised factors which go hand in hand when assessing one’s case. When assessing the value of a long term disability case, the factors are similar, but NOT the same. The age of the client, length of time which LTD benefits are owing, monthly LTD amount, CPP set off, WSIB set off, present value calculations along with any bad faith considerations for the case. There are a lot of moving parts when predicting the value of a case. And all of these values are up in the air if a Jury assigned to the case because juries are unpredictable. A: Some cases settle faster than others. Some cases settle slow than others. It all really depends on the nature of the claim, the nature of the injuries, the complexity of the claim and the insurer or adjuster. Some insurers are keen to settle faster than others. Some insurers take much harder line positions. Some adjusters get fired, quit or get re-assigned to a different department thereby causing a delay in processing/evaluating a claim. It happens! Unfortunately, there are no hard and fast answers to how long it will take for your case to settle. Q: WHAT IS THE DEDUCTIBLE FOR CAR ACCIDENT CLAIMS IN ONTARIO AND HOW DOES IT WORK? A: The following answers only applies for car accident cases in Ontario. It does NOT apply to other sort of injury claims like slip and fall cases, dog bite cases, or long term disability cases. In Ontario, the government has imposed at the behest of insurers a statutory deductible for pain and suffering claims arising from car accidents. The first $36,905.40 VANISHES right off the top of your pain and suffering claim! That means that if you had a trial today, and the Judge awards you $40,000 for pain and suffering, the first $36,905.40 is taken away from that $40,000 award leaving you with just $3,094.60 in damages for pain and suffering! That’s very little! If a Judge awards you $30,000 for your pain and suffering, you are left with a net award of ZERO after the $36,905.40 deductible kicks in! Who made up this ludicrous figure of $36,905.40? The very same Ontario Provincial Government which you elected to office. They literally bent over backwards for insurers to enact these laws. I have never heard of a single citizen in Ontario who is unrelated to the insurance industry request that pain and suffering awards be reduced for car insurance claims. The same does not apply to any other area of the law: dog bites, slip and falls, assaults etc. You also don’t see the same deductibles applying for any commercial litigation disputes, contractual matters, shipping matters, lien cases etc. Only in car accident cases does this apply. Really makes you shake your head. Q: HOW CAN I SET UP A MEETING WITH YOU? A: This is really easy. Just call us toll free at 1-877-730-1777 or reach out to us via email at info@goldfingerlaw.com and Brian Goldfinger, or a lawyer from my office will be pleased to chat with you. 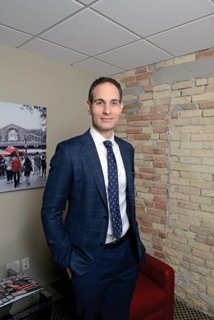 If we think you have a case, and that your case will be the right fit for our law firm, then we will be pleased to meet with you at one of our offices located in Toronto, London, Peterborough or Kitchener-Waterloo. If you can’t make it to one of our offices, then we would be pleased to meet with you in person at a location most convenient for you. We routinely conduct hospital visits, long term care visits, house calls etc. It’s free for one of our lawyers to visit you. Q: IS IT TRUE THAT “GOLDFINGER” IS REALLY YOUR REAL LAST NAME?